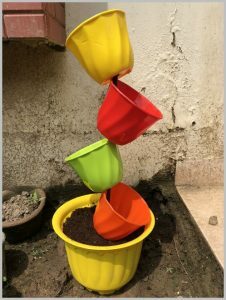 One of my favorite and easiest garden project is setting up Topsy Turvy Planters. 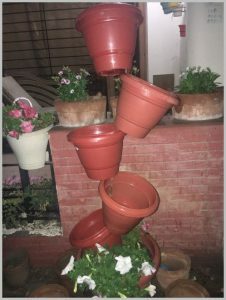 The Tilted flower pots stacked above one another make an interesting and well-talked about garden feature. 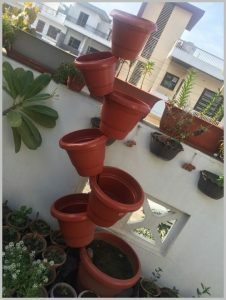 This tall flower tower is also a great way of using height to display several flower planters in a small space. If you have been living under a rock (in your own garden, of-course!) here’s what i’m talking about.. 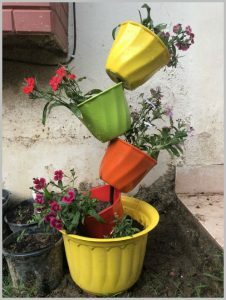 It may look complicated and delicate, but these topsy turvy planters are extremely easy to make for a fun feature in your garden. 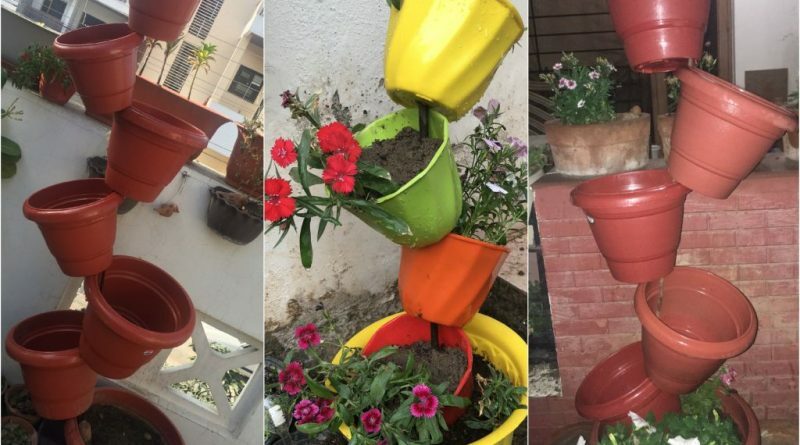 If you need a quick easy idea for using your random flower pots, Read On..! A rod that is lengthier than the height of all pots combined. I will explain this in detail later. 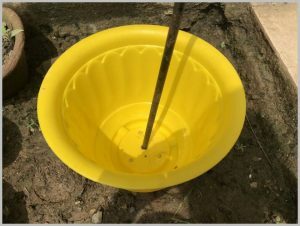 Make sure that all the pots have drainage holes in them that fit the rod loosely. 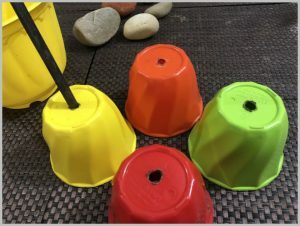 These pots did not, so i used a heated sharp tool to create a hole in each one. Note that the key to success is making sure the holes are loose enough. 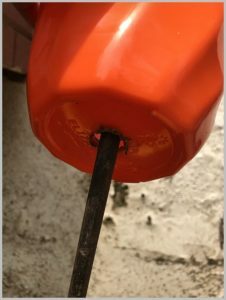 The rod should not fit through tightly but go in easily. Place the largest pot in place and insert the rod through it. 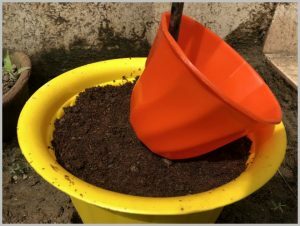 You can loosen up the soil beforehand so that it is easier for the rod to pass. 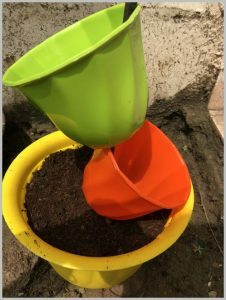 Make sure it goes in at-least 8-12 inches if you are using medium sized plastic pots. 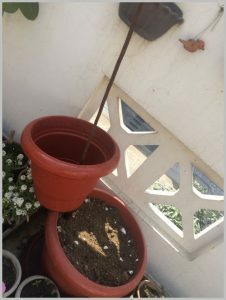 For bigger or heavier pots, the rod must go in at-least 18-24 inches for strength. 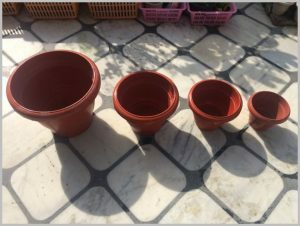 Measure the height of all pots and add them. Then add the length that will go inside the soil. Minus 3-4 from this total length. This is the final measure. This might appear complicated so you can also adjust the rod with some trial & error. 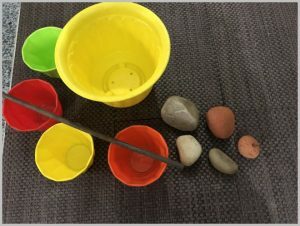 Add some rocks at the base for more stability. 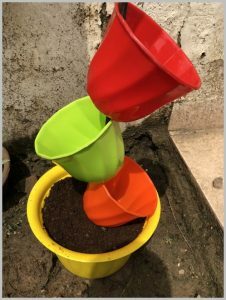 Fill it up with soil leaving 2-3 inches at the top. 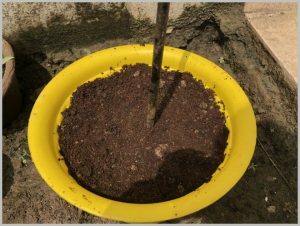 Flatten the soil tightly. Insert the next planter through the rod. Tilt it slightly. 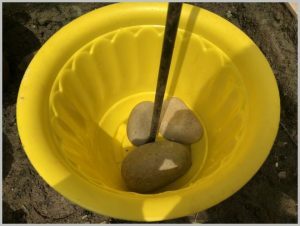 To keep it in place, insert a small rock at the bottom. Keep adding all the pots, tilting them in opposite directions. 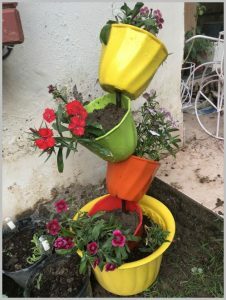 Fill in the soil & plants. We are done! 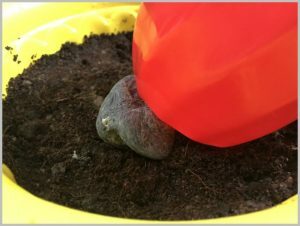 For INDOOR Tilted pots, Just take a smaller rod, do not make a hole in the base pot and add more rocks for weight. Keeping the base heavy is very important. 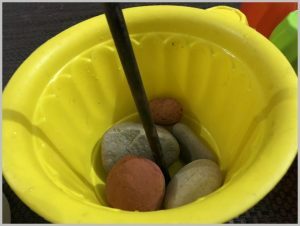 Add extra weight with rocks. The drainage holes should be loose enough to allow the tilt and also help water to drain. 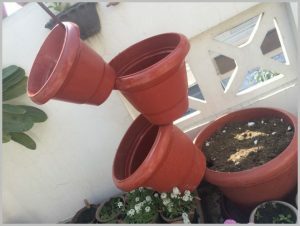 Here is another set of topsy turvy pots with different sized planters..
Do share pics of your own project and flower pots ideas.